12 15-Feb-2013 Was it a charade? 13 12-Feb-2013 Is the NC Consultation a decoy? 14.4 What can we do about it? 22 3-Dec-2012 ICT - a damaged brand? 23 27-Nov-2012 What do you mean by ICT? 35 13-Oct-2012 Am I a closet Computer Scientist? 37 10-Oct-2012 Worried about ICT in ITE? 50 9-July-2012 Wither ICT in the National Curriculum? 51 7-July-2012 What's in a name? 52 23-June-2012 Leadership and the ICT curriculum? 54 14-June-2012 What do you mean by ICT? 55 8-June-2012 What do you mean by ICT? This page is a bliki - a blog in a wiki. Thus entries are added in chronological order, with the most recent stuff at the top of the page. If you want to comment on an item then click on the Discussion tab (at the top of the panel) and reply to an existing thread or start a new one. All views expressed by me on this page are my own and do not represent those of any other person or organisation. The National Curriculum subject is going to be called Computing, but far from being the death knell for ICT this signals its rebirth. Actually doing this is a more time consuming than I had intended analysis of some responses to the National Curriculum consultation ... from BCS/CAS (who put in a combined response), Naace, and Vital. All three responses agreed that the DfE and/or National Curriculum guidance should encourage teachers to use digital technology to enhance learning across the curriculum. Naace and Vital spelt out that the PoS should explicitly reflect the way in which digital technology has changed the content of subjects. Whilst recognising that it wasn't appropriate for the PoS to tell teachers how to teach, Vital also indicated that the preamble to the PoS should make it clear that digital technology also provided new approaches to pedagogy which teachers should utilise where appropriate. All three responses thought that the draft Computing PoS needed to have the digital literacy elements strengthened. All three responses wanted greater continuity and progression in terms of safe and responsible use of the Internet across the four key stages. Naace and Vital thought that the name should NOT be changed to Computing, whilst BCS/CAS thought it should be changed. Naace suggested calling it ICT and Computing. Naace and Vital didn't feel that the Computing PoS provided effective progression between key stages, particularly in relation to digital technology and IT. Naace and Vital agreed with BCS/CAS that the computer science elements of the Computing PoS were sufficiently ambitious - indeed Naace and Vital thought that those elements might be too ambitious. However Naace and Vital thought that the digital literacy and IT elements of the Computer PoS were not ambitious enough. BCS/CAS thought that they were best placed to support schools (through the Network of Excellence), whilst Naace flagged the importance of the DfE taking responsibility for ensuring sufficient support and resources (and highlighted the important role that they and other subject associations could play). BCS/CAS weren't sure whether the NC provisions for foundation subjects should be disapplied until 2014 or not (noting that they already had been for ICT). Naace thought that they shouldn't, whilst Vital thought that the NC provision for all subject (not just the foundation ones) should be disapplied until Sept 2014. There is a lot more detail in this summary of the three responses. The deadline for responding to the NC Consultation is tomorrow - so there is still time to fill in the form and email it back to the DfE (details of where to send it are included at the end of the form). I have uploaded a Word version of my response (on the form) which you are welcome to edit (or reuse) as that might be easier than filling in the PDF version. Here is Mirandanet's response to the DfE (which doesn't seem to use the response form). I have sent off my response to the NC Consultation - the only difference to the version I shared on the 12-Mar-2013 is that I have highlighted that fact that our colleagues in Europe and Australia also refer to the subject as ICT and introducing a new name would cause greater confusion. If you haven't seen Miles Berry's draft response to the consultation I would encourage you to look at it - he makes some very good points (and goes against the flow in suggesting that we need a fully specified PoS at Key Stage 4). If you haven't already done so then make sure that you respond to the consultation and get your colleagues, friends, pupils, parents, collaborators and anyone else with an interest in our children's futures to do so too. Whilst I wouldn't suggest you replicate my draft response, feel free to use/edit it if that saves you time and helps you get across the points you want to make. You have a couple of weeks left to get your response in - the email address where you send it is on the bottom of the form. I have been urging people to respond to the NC consultation individually as well as contributing to responses from their school/organisation. I thought that it might be helpful to share with you the first draft of my own personal response (as a .doc) or (as a pdf) - both so that you can give me feedback and suggest how I can enhance it, and because it may help you in formulating your own response (I'm quite happy for you to copy any bits you would like to re-use in your own response). Please do tell me which bits of my draft response you agree with and how you would change the bits you don't agree with. If enough people give similar messages then the DfE will find it difficult not to take those messages into account. It is critical that as many people as possible send in responses. Hmm. For quite some time now I have been saying that the National Curriculum is actually pretty irrelevant, and yet I, along with a vast number of other people, have been investing a great deal of time 'debating' what it should contain. I suspect that the majority of teachers won’t actually read it in any detail (if at all) – what they will do, very sensibly, is find a scheme of work that someone has produced and use that to save them time in preparing their own plans. A growing number of schools (e.g.academies and free schools) aren’t required to teach the NC. The real driver for schools are the accountability measures that they are assessed against – these tend to focus on a subset of the curriculum (e.g. Maths and English in primary schools) and once you get to Key Stage 4 the exam syllabi are more important than the NC. So if we had any sense we would spend less time ‘discussing’ the NC and more time working on schemes of work – and perhaps responding to the national consultation on accountability metrics for secondary schools. What might be really useful is a list of all the different schemes of work in each area - so that it is easy for teachers to find them, and we don't end up with one scheme dominating (as happened with the QCA/QCDA schemes). 15-Feb-2013 Was it a charade? If you’ve been following this bliki you will know that the BCS/RAEng coordinated the drafting of an ICT Programme of Study (PoS), which was submitted to the DfE on or after the 12th December 2012. Relative to the other curriculum subjects this involved a high degree of consultation with the education community resulting in a PoS that attempted to balance the three strands of Digital Literacy, IT and Computer Science. On the 7th January the DfE published the draft National Curriculum, which included a Computing PoS that is significantly different to the ICT one that the BCS/RAEng had submitted. According to a source, who in the past has been reliable, the BCS helped re-write the PoS after the 12th December to further increase the emphasis on Computer Science. They did this at the invitation/request of the DfE/Minister. 12-Feb-2013 Is the NC Consultation a decoy? Performance tables based on ‘headline measures’ would still be published. If you have been following my account in this bliki of the discussions about ICT/Computer Science (CS) and the drafting of the PoS for ICT then you will know that I have been a little anxious about the dominance of CS and the lack of input into the draft ICT PoS by women, primary school teachers, and folk who were not associated with CAS (i.e. were not CS advocates) - even I am not foolish enough to expect that students might have been consulted. However, at least there was an attempt in the drafting process to consult with teachers and the wider community. "And we have replaced the old ICT curriculum with a new Computing curriculum, with help from Google, Facebook, and some of Britain’s most brilliant computer scientists"
So what has changed between the draft ICT PoS developed by BCS/RAEng and the draft PoS put out for consultation by the DfE? It is proposed that the subject (ICT) is renamed Computing. There have been hints recently that government thinking on this was changing (previously the DfE had stated that the name couldn't be changed without primary legislation which wasn't possible). So this isn't a total surprise, and to be honest it doesn't bother me particularly because the term ICT has been problematic for a variety of reasons, which I have written about previously (e.g. 27-Nov-2012 What do you mean by ICT?, 3-Dec-2012 ICT - a damaged brand?. For each Key Stage I have compared the final BCS/RAEng draft PoS for ICT submitted to the DfE in late December with the draft PoS for Computing published for consultation by the DfE. These are presented below as screenshots along with some explanatory comments. In each screenshot the BCS/RAEng draft ICT PoS is on the left and the DfE's draft Computing PoS is on the right. This has become more prescriptive in terms of the Computer Science elements and has lost significant parts (the whole first bullet) of what I would call the Digital Literacy elements - there is nothing here about pupils using technology to explore problems or create digital content (other than in the context of programming). There has been a slight increase in the detail of what has to be taught in relation to Computer Science. The digital literacy elements have been de-prioritised (moved from first to last bullet) and critical elements have been cut (e.g. plan, create, test and evaluate digital products for a given audience, and understanding the impact of digital technology on themselves and others). There is a significant increase in the detail of what must be taught in relation to Computer Science. Again the Digital Literacy elements have been significantly reduced and there is no mention of eSafety or identify management which I would have thought were critically important for pupils in these age groups, who are likely to be experimenting with social media and their own identity (or is that identities?). consider any aspects of eSafety, identity management, or ability to operate effectively, legally or ethically in online spaces. I am dismayed. Even if you take the narrow view that our school system (I'm deliberately not calling it an education system) is intended to prepare young people for the world of work, this proposed Computing PoS is not fit for purpose. Most workers do not need to be able to program computers. They don't even need to have a deep understanding of how computers work (though this can be helpful in some circumstances). However, all members of our society need to be 'digitally competent' - something that appears to be a minor consideration in this Computing PoS. If you agree with my analysis or are concerned about the proposed PoS for Computing then I would urge you to respond to the consultation. In analysing the responses to the consultation on the disapplication of the ICT PoS last year the DfE placed equal weighting on responses from individuals and from groups representing large constituencies. So every single individual response to the consultation is valuable. If enough people raise concerns - and more importantly suggest positive changes - then the DfE will have to listen. Last week Gove announced that he was dropping plans to replace GCSEs with a new set of examinations. These new examinations would have had ONE 'government recognised' awarding body (e.g. exam board) for each of the 'important' subjects. This new set of exams has been referred to as the EBC. Some people have (mistakenly) thought that this change means the end of the EBacc, but that is not the case. The EBacc is a performance measure rather than a qualification. It is based on the 'key subjects' of English, maths, history or geography, the sciences (i.e. biology, chemistry, physics and Computer Science), and a language. 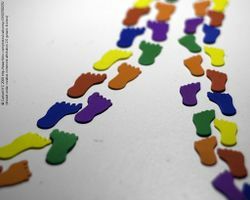 The EBacc will continue to be a significant metric for schools, though it is being proposed that this be supplemented with a new metric that looks at pupil progress (rather than just attainment at one point in time as the EBacc does). It appears that the word on the street was mostly correct ... Michael Gove has decided that Computer Science is going to be included in the EBacc alongside the other three sciences. Where I was wrong was that he didn't announce this at BETT or even via the DfE website; the news came out in a story by Sean Coughlan on BBC News. This change in policy should act as a significant lever to encourage secondary schools to invest in their Computer Science provision. In the short term there is going to be a huge shortfall in staff with relevant expertise. Last week I heard Vanessa Pittard from the DfE state that less then 69% of ICT (in secondary schools) had a post-A level qualification in IT/ICT/Computer Science. As I noted previously there are big drops in recruits for Computer Science specialist initial teacher education places - a point that is expanded upon here.However, in the longer run this problem will be addressed because schools are competing for and investing in appropriately qualified Computer Science teachers. So great news for Computer Science - and one has to congratulate BCS and RAEng for their successful lobbying! Google are working in partnership with the Raspberry Pi Foundation to give over 15,000 Raspberry Pis to pupils in UK schools. Apparently Google have committed £1million to this venture. OCR will be providing teaching and learning packs to go with the Raspberry Pis. Last week it was looking like recruitment for specialist Computer Science Initial Teacher Education places for September 2014 were significantly down on last year, which itself saw big drops in recruitment for specialist ICT ITE places compared with previous years. This reflects the general concern and confusion about the priority that the government is placing on ICT and Computer Science in schools. The shift from funding ICT specialist places to Computer Science specialist places just before applications opened last year appears to have exacerbated the problems. There also seems to have been very low take up of the shorter Computer Science Subject Knowledge Enhancement (SKE) provision that was announced in December last year. It remains to be seen whether the longer Computer Science SKEs which start later in the year will recruit better. The word on the street is that Gove is going to announce at BETT that Computer Science is going to be made part of the English Baccalaureate (EBac or should that be eBac). If this is true then that will inevitably change the whole picture - and I would expect to see Computer Science teachers (who actually have relevant Computer Science expertise) being in huge demand because there just aren't enough of them to go around at present. Though whether Computer Science graduates will be lured away from lucrative careers in Computer Science to become teachers remains to be seen. The BCS and RAEng have just published the second draft of the ICT PoS along with guidance notes and a document explaining the context. The context document notes that the membership of the working group who were writing the draft changed after feedback had been received on the first draft. It suggests that the second working group continued to include representatives from Vital, which is untrue. The rationale given to the members of the first working group for the change in membership was that this was to allow wider representation - I mistakenly assumed that this meant wider teacher representation. One of my major concerns with the whole process has been the skewed membership of the groups - which lacked sufficient women and/or teachers (particularly teachers from primary schools and/or who were not ICT/Computer Science specialists). I must admit I am left wondering whether the DfE will agree to a PoS that will require a considerable investment in professional development in order to be deliverable ... Perhaps sticking closely to the Royal Society's recommendations would give them a useful get out - they would only have to make Digital Literacy a statutory part of the National Curriculum from 2014. 3-Dec-2012 ICT - a damaged brand? Earlier this year one of the big bones of contention between groups such as CAS and Naace was about what the National Curriculum subject formerly known as ICT should be called. Naace, the ICT Association, desperately wanted to retain the ICT label, whilst CAS (Computing At Schools) wanted the subject to be renamed Computing. CAS claimed that the ICT brand had been damaged. I must admit that I had some sympathy with the view that having the Education Minister declare that ‘ICT in schools is a mess’ (Gove 2012) wasn't good for the ICT brand! By the summer it appeared to have been resolved. The message from the DfE was that the subject had to be called ICT because to change it would require new legislation, which they were not prepared to contemplate. Over the last couple of weeks the debate has re-surfaced, as it appears that a name change may now be back on the cards. Certainly BCS and RAEng are again lobbying for the DfE to change the name – though this was not discussed by either of the BCS/RAEng coordinated groups working on the drafting of the ICT Programme of Study. 27-Nov-2012 What do you mean by ICT? Wouldn't it be helpful to have different terms for each of those things? I have to admit that I struggle with whether or not technology is a plural noun – do I need to say technologies? Today a second working group met to discuss the feedback from yesterday and re-work the draft ICT PoS. My understanding is that this group includes many members of the original working group, plus new members representing constituencies such as the commercial sector, primary schools, the Teaching Schools, and higher education. CAS, Naace and ITTE continue to be represented (I believe). Feedback on the draft ICT PoS - as you are probably aware by now, the BCS/RAEng coordinated draft of the ICT PoS along with an explanatory note are now in the public domain. RAEng are hosting a consultation event for 40 or so people on the 19th November (invite only - and I don't know who is being invited) but you can also email in your feedback to pos@bcs.org.uk before the 19th. All this feedback is being collated by the BCS/RAEng and fed back to the DfE. So it is worthwhile getting in your 2p worth now. Call for developers of Computer Science curriculum materials for Primary - The Royal Academy of Engineers (RAEng) has put out two calls for proposals to develop course materials to support the teaching of Computer Science - the first call is for 10 hours of computing curriculum at Key Stage 1 and 2 the second if for 10 hours of practical computing curriculum at Key Stage 2. Embedding technology in core subjects - you have just over 24 hours to have an input into the recommendations that we are making to the DfE about how digital technology should be embedded within the PoS for English, Maths and Science. See the entry below for the 5-Nov-2012 for info on how to contribute. Initial Teacher Training allocations - find out about funding and allocation of places for ITT for 2011/12, 2012/13 and 2013/14. Not very exciting but very important ... How are we going to get enough teachers with expertise in ICT, Computer Science, TEL and Embedded Technology? Thank you to everyone who sent in feedback on the drafts of the core NC PoS despite the very tight timescales. We have updated our draft suggestions to reflect these changes - bearing in mind the need to keep the changes VERY minimalist. Help us provide the DfE with 'expert advice' about how they might respond to the need to ensure that ICT is adequately referenced within the Programmes of Study for English, Maths and Science (at Key Stages 1 and 2). As I noted on the 27th October, we have the opportunity to provide input to the DfE which MAY lead to minor tweaks to the PoS for the core subjects before they go out for national consultation next year. Having read the drafts post SPECIFIC suggestions/comments (including page/paragraph numbers) in the Comments section below or email them to Peter.Twining@open.ac.uk - before 8am on 6th November. If you want to comment on this item then please add your comment by putting ~~~~ at the start of a new line, followed by your comment. To respond to a comment put :~~~~ (the bit between the nowiki statements) on the (new) line below the comment to which you are responding, followed by your response. We may have the possibility of influencing the content of the draft PoS for English, Maths and Science before they go out to public consultation in 2013. Very small window of opportunity (less than two weeks). Focus is explicitly on how ICT changes the nature of the subject - and thus what is different about what pupils need to be taught. NOT looking at how ICT can change pedagogy (in this instance). If you have relevant expertise and would like to be involved then contact me urgently with details of who you are, what your relevant expertise is, and your contact details. Looking to form a small expert group - meeting this Tuesday in Milton Keynes with follow up by email etc. BCS and RAEng have published the draft PoS for ICT along with a covering document with the DfE's consent. Hopefully today is the day that the draft of the ICT PoS that BCS/RAEng coordinated the development of will be made public ... if you spot it before I do please let me know @PeterT on twitter or email Peter.Twining@open.ac.uk. I was contacted yesterday by a journalist from V3 to tell me about a campaign they launched on Wednesday to Boost IT Teaching across the UK. They are keen to hear from teachers about what they think should be included in the ICT Programmes of Study - you can contact the journalist (Rosalie Marshall) by clicking on her name near the top of their article. The basic message seems to be that any programme that equips 'trainees' to teach 'this subject' to at least GCSE level and features Computer Science in the title will be elegible to have places allocated to it. Programmes called 'Computer Science', 'Computer Science and ICT', 'ICT and Computer Science' and 'Computer Science with ICT' are all acceptable. Programmes called 'ICT with Computer Science' are not acceptable. This applies to both School Direct and 'core ITT' places. Now you know ... panic over? If you have been following my posts on the development of the ICT PoS you will know that the DfE and BIS were jointly hosting a ‘roundtable meeting on digital education and the new ICT curriculum for schools’ today. The participants spanned industry (e.g. Apple, IBM, Hewlett Packard, Microsoft Toshiba, Cisco, Facebook, BT, an educational publisher, De Loite), commercial associations (e.g. BESA, e-Skills Uk, Intellect), professional associations (e.g. BCS, RAEng, NextGen), sector associations (HEA, LSIS), school focused organisations (e.g. Ofsted, DfE, Naace, CAS, ITTE, Vital, NFER/Futurelab, NTAB), and no doubt a range of other people I have overlooked (sorry). Input by the chair of the BCS/RAEng coordinated group who developed the draft of the ICT PoS – highlighting key issues he wanted the roundtable to address in relation to the draft and covering note (both of which were tabled). Discussion about ICT in schools spanning the ICT PoS and cross curricula use of ICT (which folk referred to as Technology Enhanced Learning (TEL)). Inputs and some discussion about the FE and HE sectors (which I have largely ignored below). “Utter confusion in schools about ICT” – and a concern (which may be overegged) about schools de-prioritising ICT. A need to overcome the confusion in schools about terminology (ICT being used to describe ‘the subject’, the equipment and infrastructure, and TEL (cross curricula use of new technology) – if you have been reading my previous postings you will know that I think the current definitions of CS/IT/DL in the draft PoS just make matters worse. Agreement that TEL was a bigger issue than ICT (the subject) or specialisms in CS/IT/etc. – there appeared to be universal agreement that the use of new technology needed to be an explicit requirement in all subjects (because new technology has changed all disciplines outside school). Agreement that ICT provided new pedagogical strategies, but that it was not the job of the PoS to specify pedagogy. Agreement that having the three strands of Digital Literacy, Information Technology and Computer Science within the ICT PoS was important. Agreement that it was important for everyone (and teachers in particular) to recognize that the PoS were a high level framework, not a detailed curriculum, scheme of work or list of things to be ticked off. Agreement that there was a massive expertise gap in relation to ICT (the subject) and TEL – and that there needed to be extensive staff development to help address both these areas. However, it is highly unlikely that the DfE will fund this as their stance is to say that it is up to schools to decide where/how to allocate resources. Agreement that there needed to be incentives to ‘encourage’ schools to prioritise staff development re ICT (the subject) and TEL – and recognition that this needed to include both carrots and sticks (e.g. make Computer Science were part of the eBac; provide schools with evidence that ICT can enhance learning outcomes across the curriculum; Ofsted need to be feeding back on the importance of ICT; utilizing parent/pupil power to encourage schools to engage; etc). Clearly the DfE have a role to play in making sure appropriate incentives are in place. Agreement that assessment was a key driver and barrier to change, particularly in relation to the sets of skills that employers most need (what some might label ‘knowledge age skills’) including being digitally literate citizens. This is not a comprehensive list of all the things that were discussed – I have for example omitted reference to a concern that schools are holding back on buying Tablets and other mobile devices until they have some guidance from the DfE about their implementation (which the DfE is unlikely to provide directly but Vital is working on as part of its work on Vital Guides and EdFutures.net). I have also not tried to explain CAS’ plans for providing CPD to ‘up skill’ Computer Science teachers (which I have to admit I am yet to be convinced is sustainable). There were no explicit actions from the meeting - other than for the DfE (and BIS) to go away and reflect upon the discussions. So whether this will have any impact remains to be seen. The final draft of the draft ICT PoS (I put draft twice deliberately) is being submitted to the DfE today by the BCS/RAEng. I believe that the BCS/RAEng will be seeking permission to make this document public as 'expert advice' from the BCS/RAEng to the DfE. Hopefully this permission will be forthcoming in the next day or so. I suspect that the BCS/RAEng will, with the DfE's agreement, be hosting a consultation event with 50 or so 'representative stakeholders' in mid/late November at which their 'expert advice' (i.e. the draft they submitted) will be scrutinised further. If/when I hear anything more definite I will let post it here ... and of course I will (if allowed) provide an update on tomorrow's DfE/BIS consultation workshop tomorrow! Also on Friday (19th) ITTE, Naace and Mirandanet sent a joint letter to Mr Gove (cc'd to a long list of other interested parties) raising their concerns about the potential impacts that this change in focus for ITE would have. Read the full text of that letter. 13-Oct-2012 Am I a closet Computer Scientist? I'm beginning to worry that I'm becoming a closet Computer Science advocate. Group think is a known problem, so I guess being part of a group that is dominated by male (all but one member of the group) members of CAS (all but one member of the group) is bound to orient me towards computer science. Should we introduce algorithms in the Key Stage 1 PoS for ICT? Would you agree that in Key Stage 1 pupils should be taught about giving instructions? For example, how to make a sandwich, how to plant seeds, or how to get your Roamer/Big Track to go from one side of the carpet to another. If you think they should, then would you have a problem with explaining that an algorithm is a set of instructions to solve a problem and that the instructions that we use to control computers are algorithms? Should we introduce computational thinking in the Key Stage 1 PoS for ICT? Let me break that down a bit ...Would you agree that we want pupils in Key Stage 1 to start to learn to solve problems of increasing complexity? I feel uncomfortable talking about algorithms and computational thinking in the Key Stage 1 PoS, but am totally comfortable with pupils in Key Stage 1 learning about giving instructions, controlling programable toys (e.g. Roamer, Pip, Big Track, Turtles), and learning to solve increasingly complex problems. Is this just because I'm scared by the jargon or am concerned that I may actually be a closet Computer Scientist, or is there a more fundamental issue that I'm finding it hard to explain? Before I comment I'll start by confessing that whilst not an out-an-out computer scientist these days, it is my natural inclination (my background is in Maths & AI). Saying that, the thought of overcomplicating a concept as simple as 'giving instructions' through unnecessary jargon rather worries me. Aren't we in danger of confusing learners through a potentially muddled use of the terms 'program' and 'algorithm'? Is introducing what is very computer-science-centric language to what are actually broader concepts/skills really what we should be doing? e.g. isn't 'problem solving' a sufficient description for computational thinking at this level? There was a productive meeting re the ICT PoS today, which focused on the feedback to the initial consultation. Whilst there has been more consultation on the draft ICT PoS than for other Fundation subjects, it was acknowledged that there were concerns in the wider community about the need for further engagement with stakeholders, and in particular with teachers in primary schools and folk who are not Computer Science specialists. The level of consultation on the ICT PoS so far reflects the very tight timescales that BCS/RAEng have had to work within – the MoU was signed on the 18th September and the draft of the ICT PoS have to be with the DfE on the 22nd October (in time for a meeting on the 23rd October organized by the DfE and BIS to consult on the ICT PoS). I believe we will see the BCS/RAEng urging the DfE to allow them to lead further consultations on the draft PoS in November, prior to the three month consultation on the National Curriculum which the DfE is running early in 2013. So hopefully there should be a number of opportunities for interested parties (i.e. you) to put in your 2p worth before the DfE makes their decisions at some point in 2013, about what the final draft should look like. These further consultations need to focus on the specifics of what is to be included for each Key Stage (rather than the introductory blurb, which I described as 'Hot air' in my post on the 4-Oct-2012). Of course all of this may be irrelevant - the killer question is going to be what the assessment criteria are – as that is what teachers will, quite reasonably, focus on. The BCS/RAEng brief did not include reference to assessment criteria – their focus was very firmly on what should be taught rather than what should be learnt. Let’s hope that the experts in 5-19 education (i.e. teachers and teacher educators) are asked by the DfE to take the lead in developing the assessment criteria for ICT in the National Curriculum. Maybe we should focus on that here rather than worrying about what to teach? Mwclarkson 18:40, 11 October 2012 (BST) I would argue that a lack of assessment criteria denotes a focus on what should be learned rather than what should be assessed (one of the issues I have had with ICT at KS4 for some time is that the assessment is, at best, a poor reflection of what the students should have learned). I am sure that this will come, but my experience of controlled assessment in WJEC GCSE ICT (for example) is that the mark scheme is far more focused on box-ticking than is the case with OCR GCSE Computing. That doesn't make this an ICT vs Computing issue, it's about an approach to assessment as a necessary evil in learning rather than the be-all and end-all. I, for one, am quite glad that the focus will be on what we want students to examine, investigate and learn about rather than what the answers will have to be. I think I agree with Mwclarkson that assessment can distract from learning. The problem is that there will be assessment criteria I suspect at some point ... We need to ensure they support learning. 10-Oct-2012 Worried about ICT in ITE? The announcement that there is no funding for ICT specialist initial teacher training courses from next September is causing quite a stir within the university based initial teacher training providers. My understanding is that applications for places on next year’s courses open in a few days time. Those courses have already been designed and staffing plans put in place. Prospectuses and other information for potential students were prepared long ago. How are the ITEs meant to respond to the new requirements before registration for places opens? The HEIs that have courses branded ICT and Computer Science seem to be feeling more confident about the future than those who have specialist ICT courses. Whilst I think most people recognize the need to have more appropriately qualified Computer Science teachers, there is a general concern about the message that this announcement sends out about the importance of ICT as well as about its timing. It does seem odd that you cannot have specialist initial teacher education provision for a subject that is in the National Curriculum (i.e. ICT) but can have specialist provision for a subject that isn’t in the National Curriculum other than as a subset of ICT (i.e. Computer Science). Perhaps the logic is that it is easier for someone with a Computer Science background to teach ICT than it is for someone with an ICT qualification to teach Computer Science. If you want to comment on this item then please add your comment by putting ~~~~ at the start of a new line, followed by your comment. To respond to a comment put :~~~~ on the (new) line below the comment to which you are responding, followed by your response. I wonder if there are currently enough schools that can provide suitable placements for trainee teachers of computer science. Talking with colleagues in Initial Teacher Education I think the answer to that is very clearly that there aren't. Today is the deadline for feedback on the 'closed' consultation on the ICT PoS. There is a meeting of the core team on Thursday 11th Oct at which I guess that feedback will be considered. In the meantime email exchanges have been taking place within the core team around the draft of the details of what to include in the PoS at each Key Stage. You will know from my previous posts (below) that this is what I think we need to consult on, all the rest is waffle and hot air as far as the impact it is likely to have on what teachers actually do in their classrooms. The unofficial draft of the ICT PoS is starting to fill out - but needs more input from teachers and pupils - this may well be your best chance to influence the details of what is included in the PoS. By the time the official draft of the details are made public in November they will already have been agreed by the core team and submitted to the DfE (on the 23rd October). The debate about the ICT PoS consultation document is hotting up in the Naace and CAS forums (particularly in CAS where there are two very active threads). I have to admit that I think this is all pretty much hot air, because the consultation document doesn't include any specifics about what should be taught at each Key Stage. So folk are discussing definitions and relative importance of Computer Science. I think it would have been better if we had circulated the full draft of the ICT PoS, including the details for Keys Stages 1 to 3. ZoeR 07:05, 6 October 2012 (BST)I couldn't agree more! I am saddened by the time taken up thinking of new words and definitions, rather than just getting on with what will be taught. Will contribute my tuppence worth re what I think should be taught at KS3 on the POS. PeterT 08:03, 6 October 2012 (BST) Thanks for sticking your head above the parapet Zoe. Bill Mitchell (BCS) has posted the full wording of the initial 'restricted' consultation on the ICT PoS on the CAS forum. That effectively means that this is now in the public domain, so I have copied it here. A new bursary for computer science has been introduced as top universities and schools will be invited to run new computer science teacher training courses from 2013/14. Funding for the current information and communications technology (ICT) courses will end at the same time to reflect the disapplication of ICT curriculum. In the same press notice there was information about the new School Direct programme which is recruiting for trainees for September 2013. Should we be even more worried about the status of ICT? Its is going to be vitally important that we ensure that the BCS/RSEng coordinated PoS for ICT isn't too heavily weighted towards Computer Science. The closed consultation with a selected group of people has started - I believe emails were sent out today at around 10am. The deadline for responses is the 8th October. This consultation does NOT include any of the details of the PoS for each Key Stage - it covers the introductory blurb (Purpose, Aims, etc) and asks some broad questions about what folk think the PoS should look like. There is also a specific question about what to do about ICT at Key Stage 4 (because there is a tension between having a National Curriculum PoS for ICT at KS4 and the reality that schools' focus changes to the GCSEs). The three strands labelled Principles (or Foundations), Application, and Implications have been replaced by strands for Computer Science, Information Technology and Digital Literacy. The rationale being given for why the drafts of the details of the content of the PoS at each Key Stage are not being shared at this point is that they are not sufficiently well worked up yet. Every child should have the opportunity to learn concepts and principles from Computing (including Computer Science and Information Technology) from the beginning of primary education onwards, and by age 14 should be able to choose to study towards a recognised qualification in these areas. A select group of people (I don't know who) are due to be consulted by BCS and RAEng tomorrow about the draft PoS for ICT which BCS/RAEng are coordinating work on. The BCS/RAEng press release says that a draft of the PoS will be made public in November. Totally independent of that work I thought it would be interesting to see what you would include in the PoS for Key Stages 1 to 3. So I have set up a blank PoS template, which you can edit and/or comment on. Read the BCS/RAEng press release re the MoU with the DfE. The interesting development is that a draft will be published in November. The mechanism for getting feedback isn't clear yet. BCS/RAEng seem to be listening to concerns re representation - a new member of the drafting group is a primary school teacher (or was until very recently). A NFER survey of ICT teachers in April this year suggests that programming is not seen as a high priority for the majority of schools. NFER went on to suggest that more work needs to be done on professional staff development of ICT teachers. I think it is clear that one of the major problems with the teaching of ICT in schools (particularly at Key Stages 3 and 4) is the lack of suitably qualified ICT teachers (i.e. people who have a relevant degree). However, I think that we also need to clarify that whilst programming is an important element of Computer Science (and will no doubt be an element of the ICT Programmes of Study in 2014), the discussions in the media have tended to talk about Computer Science and programming as if they were synonymous, which of course is not the case. Indeed, I think that many would claim that computational thinking is in many ways more important than programming. The TES reports the findings of a NASUWT survey of 2000 reaches which seems to reinforce the concern that the dis application of the ICT Programme of Study will have a detrimental impact on ICT provision/teaching in schools. NB I have updated this entry to correct a mis-understanding that I had of the process for sorting out the draft PoS - the first draft will only be circulated to identified stakeholders for feedback, not made public for general feedback. On the 18th September 2012 the DfE signed a memorandum of understanding (MoU) with the British Computer Society (BCS) and the Royal Academy of Engineering (RAEng) which invites them to coordinate the development of the draft ICT PoS covering all pupils in Key Stages 1 to 4. The MoU sets out some expectations about the anticipated form and content of the revised Programmes of Study for ICT, about the process for developing them, and the timescales. The MoU states that "It is essential that the Programme of Study is developed in association with and has “buy-in” from key stakeholders across the sector". The draft PoS have to be submitted to the DfE by the 23rd October 2012, and will be published (subject to changes following review by Ministers) in early 2013 for full public consultation. On the 19th September 2012 there was a meeting, chaired by Simon Peyton-Jones (CAS) and attended by representatives from BCS, RAEng, Naace, ITTE, CAS, NextGen and Vital. These included three Computer Science secondary school teachers, two academics from Computer Science departments in Universities, and three academics from Teacher Education (two of whom have a primary school background). We then proceeded to debate our views on the Purposes and Aims of ICT. The importance of ICT being inspiring and creative was emphasised, as was the critical need for the impact of ICT on all disciplines to be recognised and thus built into the PoS for all the other subjects. We talked in quite a lot of detail about the specific 'elements' that should be taught at KS1 and KS2 - and again there was a high level of agreement. We spent a little less time on KS3 due to the pragmatics (people needed to leave!). There was some concern expressed about there being a PoS at KS4 - some members of the group felt very strongly that the ICT PoS shouldn't cover KS4 because of the realities of how that might work given that the main drivers at KS4 are the national exams (currently GCSEs). On the 1st October we expect to have a full first draft of the ICT PoS ready to share with identified stakeholders (NOT 'all interested parties' as I originally reported) Those stakeholders will only have about one week to feedback (all feedback on the first full draft of the ICT PoS has to be in by 12 noon on the 9th October). There will of course be opportunities for everyone to respond to the public consultation in 2013. Building on feedback to my initial bash at a Programme of Study for ICT (see 15-June-2012 below) which fits on to one side of A4 I have created a new draft PoS for ICT. I have formatted as per the draft PoS that the DfE published for the core subjects (i.e. with PoS on the left and notes/guidance on the right). The National Curriculum for ICT aims to ensure that all pupils are able to operate effectively as a citizen in the 21st century. Information technologies include all digital media (e.g. Internet, computer programs, apps, ebooks, digital video, etc). 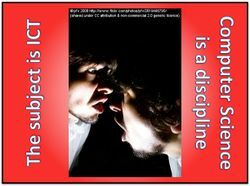 They impact on culture, ways of knowing, meaning making, ways of interacting, the nature of disciplines, and ways of working. Understanding information management includes knowledge about data structures and the differences between data, information and knowledge. A PLN includes f2f as well as 'technology mediated' information exchange/knowledge building. It would include understanding about digital identities and being able to manage their own digital identities appropriately. An issue might include a problem, debate or question that they need to investigate. Approaches to investigation could include: searching for information, critical appraisal, data handling, data logging, use of dynamic modelling including simple programming. It would involve the ability to choose and use appropriate tools, as well as understanding of Boolean logic, search strategies, and algorithms/heuristics. Re-presentation of information might include the use of hypermedia, multi-media, dynamic models, and procedural representations. 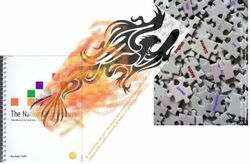 It brings in ‘digita 'making' and creativity, as well as choosing and using appropriate tools, and elements of Computer Science such as coding/programming. Computational thinking provides a way of looking at the world and analysing problems. It includes the ability to use computer programs to model ‘physical world’ scenarios. What is wrong with this - or perhaps more helpfully how would you improve it? You can either comment below or go to Google Doc version and add comments. At the ITTE Annual Conference last week I had interesting discussions with a range of folk, including Simon Peyton Jones from CAS, about the Naace/CAS/ITTE joint paper. I think we made significant progress in addressing some of the concerns that I have expressed (see 12-July-2012 below) about our joint statement (I say ‘our’ because I am a member of all three organisations!). 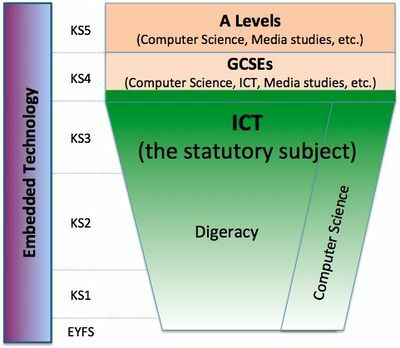 There needs to be a broad and balanced curriculum spanning KS1 to KS3, which will be called ICT (the statutory subject) and will include Digeracy (a placeholder label) and elements of Computer Science. Digeracy includes all those elements of ICT which are not part of Computer Science, such as understanding the impacts of new technologies on society, being able to use new technologies safely, being able to find, evaluate, interpret and re-present information in a range of formats (multiple media). We probably need a better label than Digeracy, but it needs to be something that doesn’t carry any baggage with it. The Royal Society report on Computing in Schools defines IT as “the assembly, deployment, and configuration of digital systems to meet user needs for particular purposes” (p.17). You might think of this as systems analysis. Simon and I agreed that this should NOT be taught in schools and should NOT be part of ICT (the statutory subject). The DfE state that ICT (the statutory subject) will span KS4 as well as KS1 to KS3. This would provide an entitlement for all pupils, even if they were not taking a GCSE in ICT, Computer Science or some other related subject. It would require a change in how schools plan their timetables at KS4 as all pupils would need to take ICT, with some taking it as a GCSE and others as a non-examined statutory subject. This is likely to be challenging for schools and there is a real danger that it would lead to further criticism of KS4 ICT by Ofsted (of the kind that ended up with ICT across all Key Stages being unfairly rubbished). One of the sticking points within the discussions between Naace, CAS and ITTE seemed to have been about how to define Digital Literacy, which is why it was totally ignored within the joint statement itself. On probing it seems that CAS don’t mind how it is defined – but are keen that ICT (the statutory subject) is presented as consisting of two elements: Computer Science and what I have (temporarily) called Digeracy. Digital Literacy would be an important (some might say the most important) component of Digeracy. 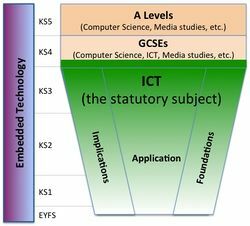 Figure 1 provides a summary of where I think we have got to in our shared understanding of what the future curriculum relating to ICT (the statutory subject) and related specialisms at KS4 and KS5 ought to look like. Whether we need a label such as Digeracy to refer to those elements of ICT (the statutory subject) which are not part of Computer Science, and if so what that label should be. The balance between Digeracy and Computer Science within ICT (the statutory subject). The specifics of what the Programme of Study for ICT (the statutory subject) should include, bearing in mind that the PoS for ICT will be very high level (one side of A4 in total). What additional (non-statutory) information should be provided to support teachers in implementing the PoS for ICT? Thanks for that Allison. If all at Naace buy into the description of Digital Literacy that is in the Futurelab document then I think that there really isn't much of a problem - though I would advocate having a more concise definition rather than the rather length description in the Futurelab document. Would the definition below work for you? I have to say I agree with most of what Roger has said. He is totally right about my definition of digeracy being too narrow - see my first bash at an ICT PoS (15-June-2012 below) which is closer to what I think we need for ICT as a whole (though I know that some folk think that there needs to be more computer science than I included). What other aspects of ICT do you think we need to include in the PoS? I don't think that there is any intention - at least not on my part - of Computer Science being presented as discrete from ICT (the statutory subject) before KS4. The diagram is intended to show that ICT (the statutory subject) includes elements of Computer Science (as well as Digeracy). I also take the point about embedded technology - this is an adaptation of the joint Naace/CAS/ITTE diagram and my suspicion is that their intention was to signal that there is this other stuff (which some would call TEL) which is not what their paper is trying to deal with. I think that the whole debate about ICT in the curriculum has been skewed - whilst Computer Science is important and teaching it well at KS4/5 is a major challenge, a much larger issues is ensuring that every teacher understands how new technologies have changed their disciplines and provided them with a wider repertoire of pedagogical approaches and that they thus need to embed technology in their teaching no matter what their subject - I have ranted about this elsewhere (see this blog post for example). Those who are highly committed to computer science, who quite understandably over-stress it and wish to see it as a separate subject rather than as part of ICT, tend to also have a very poor vision of the extent of ICT capability. Peter's definition of digeracy above is a prime example; it makes no mention of solving problems using ICT tools, which is the core of ICT capability at all levels. Computer science is of course also about solving problems, but one would only resort to the techniques of computer science and programming if appropriate ICT tools do not already exist, that one's ICT capability enables one to use. ICT capability goes way beyond anything that could be described as digital literacy or digeracy, and this is not being acknowledged by Peter in this posting. 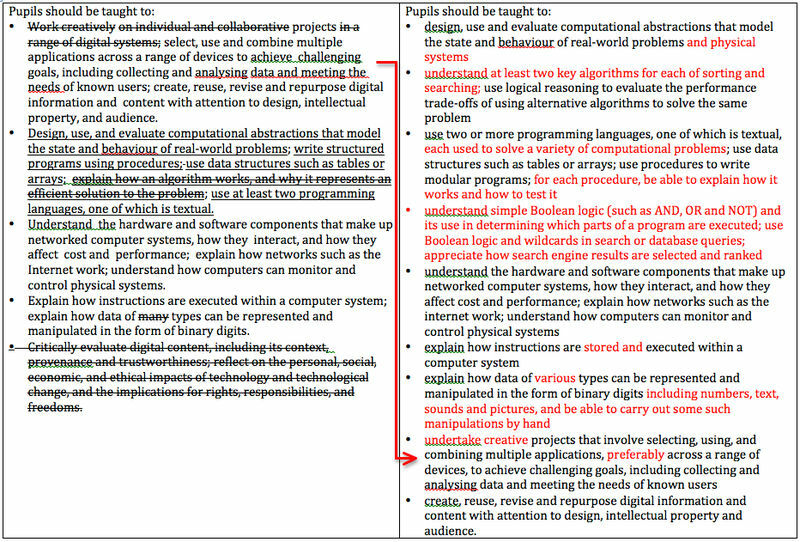 The other issue in Peter's diagram above is the extension of a computer science 'subject' right down into KS1 and 2. I know of no school that would dream of separating computer science out as a subject separate from ICT at this level. Certainly teachers need to be aware of it as a component of ICT, just as they need to be aware of embedded technology and the ICT capability that will crystalise into separate subjects such as web development, games development, business systems, IT & network systems and so on. Should we also see these as subjects alongside computer science all the way up from KS1? Of course not. ICT is the subject through primary into secondary, that develops more specialisms as it develops through secondary just as science does. Probably most fascinating in the diagram is the way Peter has put embedded technology as a subject theme completely outside of the main diagram, yet it is the most pervasive of all aspects of ICT, with numerous computers now in your car for example controlling many functions. This is the really invisible part of ICT - by comparison the need to make pupils aware of computer science as they get older is obvious! 9-July-2012 Wither ICT in the National Curriculum? The subject associations for ICT (Naace) and Computer Science (CAS) and the Association for IT in Teacher Education (ITTE) recently published a joint statement about their view(s) on how ICT in schools should be reformed, and in particular the relationship between ICT and Computer Science. Getting some agreement between Naace, CAS and ITTE on the ‘computing curriculum’ is a great breakthrough. However, I have significant concerns about some aspects of their joint statement. 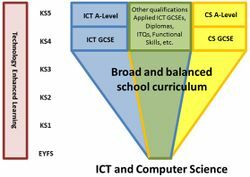 Their position is basically that there should be a broad and balanced ICT and Computer Science curriculum from Foundation Stage up until Key Stage 3, with a range of options at Key Stages 4 and 5, including Computer Science, as illustrated in the Figure on the left (Naace, ITTE and CAS paper p.3). At first glance this seems spot on, however, on closer examination there are some worrying aspects to their stated position. Whilst I agree that the ICT brand has been damaged by the recent (and in my view often unjustified) criticisms of it, the government would have to enact primary legislation to change the name of the National Curriculum subject. 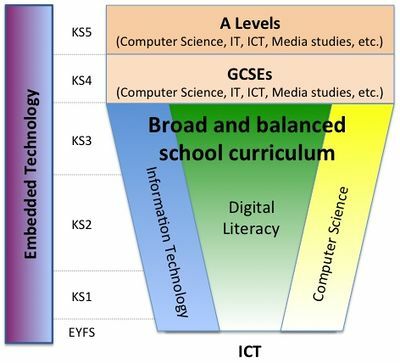 This means that the ‘broad and balanced’ subject is going to be called ICT in the revised National Curriculum from September 2014. So why have they decided to call it ‘ICT and Computer Science’? Equally worryingly, why have they ignored some key aspects of the Royal Society Report on Computing in Schools? This was an independent, in depth study looking at how to enhance the teaching of computing in schools, which Naace and CAS both contributed to. Why have they ignored the Royal Society’s definitions of key terms such as ICT, IT, and Computer Science? Is it because CAS does not accept that Computer Science is a subset of ICT? Why does their definition of ICT reframe it to focus on the application of technology (which the Royal Society would equate with IT) rather than on finding, analyzing, evaluating and re-presenting information? Why do they seem to ignore Digital Literacy as part of the broad and balanced school curriculum when the Royal Society recommended that: “only the teaching of digital literacy is made statutory at this point” (Royal Society 2012 p.10). I suspect that the answers to these questions would reveal quite deep divisions between CAS, Naace and ITTE about what the curriculum in schools should consist of. Indeed, even within this joint paper they end up referring out to the separate and competing curriculum guidance from CAS and Naace. A model that took into account the Royal Society Recommendations would look more like Figure 2 (below), though the Royal Society explicitly excluded considering cross-curricular use of ICT (Embedded Technology). The DfE have stated that they expect a draft ICT Programme of Study for Key Stages 1 and 2 will be published later this year. This apparently will be based on advice from ‘experts’ in the field, including industry, academics, subject associations, and teachers. However, the DfE does not appear to be intending to provide any coordination or leadership of these ‘experts’. As we have seen, there are deep divisions between some of them, who seem more concerned with protecting their own interests than developing an optimal ICT curriculum entitlement for pupils. There is one group that might have sufficient authority and balance to be able to lead on the development of the ICT Programmes of Study. That is the Teaching Schools’ New Technology Advisory Board (NTAB). This group was set up by the ICT specialist Teaching Schools, coordinated by Paul Haigh at Notre Dame High School and chaired by Bob Harrison. Whilst it includes representatives from Naace, CAS (& BCS), ITTE, and a range of other ‘interest groups’, it also has a broader membership from industry and the education profession, who are more concerned with coming up with the optimal solution for pupils and our education system than with protecting a particular party line. Let’s hope that NTAB provide the leadership that we desperately need, and that the DfE endorse NTAB’s recommendations. Thanks Peter for this excellent thoughtful and helpful contribution to the debate. I share your anxieties and do not accept that the "ICT brand" is damaged to the extent that some have argued (usually by anecdote and opinion rather than evidence!). I thinkit is vital (and perhaps a role for vital) to move towards a consensus on terms so we can move on to the more important task of the programmes of study. Vanessa Pittard said at the WEF that "this is the most hands of ICT Government "she has known but surely there is a need to the DfE to broker and facilitate a consensus amongst the "experts"? Who are they by the way? When are they meeting and what and when will we see the outcomes? I feel there is something of a "turf war"under the guise of definitions and glossary of terms and unless we,the teachers and education professionals, attempt to get some resolution and clarity to this issue we will end up with the worse possible outcome....................Ministers will decide!!! You will see in my follow on post (12-July-2012 above) that the DfE think that ICT (the statutory subject) should continue into KS4, which is one of the points I think you are making. 7-July-2012 What's in a name? Ok, so I am somewhat evangelical about thinking we need to define key terms related to ICT (see http://www.vital.ac.uk/blog/what-do-you-mean-ict). I genuinely believe that many of the problems we have had with ‘ICT’ in education come down to us talking at cross-purposes because we use terms sloppily. I’ve been struggling to understand why so many people seem to have such difficulty in agreeing on terminology – and then it struck me. Every school focused English/UK association involved in the field of educational technology that I can think of has a name which may make agreeing on terminology challenging. Naace (the National association of advisors in computer education) had to re-brand themselves as the ICT Association. Despite the damage that has been done to the ICT brand in England, you can understand why Naace are desperate to maintain ICT as a subject in its own right that subsumes elements of IT, Computer Science and Digital Literacy. Naace are also interested in ICT across the curriculum. ITTE (The association of IT in Teacher Education) whose interests go beyond IT to include ICT (the statutory subject) and Computer Science, as well as embedded technology (which many, misleadingly IMHO, refer to as TEL). The one group to have escaped relatively unscathed are ALT (the Association of Learning Technology), who have less of an axe to grind about particular terminology (and are quietly expanding their constituency from HE and FE into schools). 23-June-2012 Leadership and the ICT curriculum? The DfE is taking a hands-off approach to ICT as Gove promised that they would do in his BETT speech in January and reiterated by Vanessa Pittard at the Westminster Education Forum on the 12th June. This leaves a major void in terms of who is going to coordinate the development of the A4 ICT Curriculum (see 15-June-2012 below). Whilst Naace (the subject association for ICT), CAS (the subject association for Computer Science) and ITTE (The Association of IT in Teacher Education) need to be involved they each have particular vested interests, which so far appear to have outweighed the need for reaching an optimal solution in terms of the Programmes of Study (PoS) for ICT from 2014. I anticipate that we will see a joint statement from CAS, Naace and ICT in the next week or so, which will provide a high level joint position. However, I am not convinced that there is sufficient agreement for this group to come up with an optimal A4 ICT PoS. There is a real danger that we will end up with a compromise curriculum designed by a committee comprised of vested interests. That would be a disaster. So who could provide the necessary lead? I can think of only two groups which have sufficiently broad representation to be credible: The Vital National Consultative Board and the Teaching Schools New Technology Advisory Board (NTAB). Both include representatives from Naace, CAS, ITTE, ALT (the Association for Learning Technology), universities, teaching unions, industry, and other interested parties such as Lord Lucas and Lord Knight. Whilst you might expect me to think that the Vital board is the best bet, in this instance I don’t. My money is on the NTAB as being the only credible group to lead on the development of the A4 ICT PoS. Let’s hope they can provide some leadership to fill the void left by the demise of Becta and the ‘hands-off’ stance of the DfE. I’m working on the assumption that the ICT PoS will reflect the view of the Royal Society Report on Computing in Schools, which recommended that all pupils should have a broadly based Computing curriculum - the Royal Society explicitly equates Computing with ICT, so they are recommending a broadly based ICT curriculum, which should include elements of IT, Computer Science and Digital Literacy. Pupils should then (at Key Stage 4) have the option to study Computer Science as a specialism. be able to safely develop and maintain an effective personal learning network (PLN) - with PLN being defined broadly, so including f2f as well as 'technology mediated' information exchange/knowledge building (and including books as a form of technology) - this would include understanding about digital identities and being able to manage their own digital identities appropriately. Not bad, although not sure about books as a technology and adding the computer science elements under the area that screams 'PowerPoint' to me is potentially damaging.. I agree with the content and welcome 4 succinct key points which I'm sure we will start to flesh out to provide more guidance for teachers. Perhaps in bullet point 2 broaden out the middle of line 2 to include something along the lines of ... 'through using new technologies to encourage pupils to be explorers, communicators and producers of knowledge'. 14-June-2012 What do you mean by ICT? 1. The ICT Programmes of Study (PoS) and Attainment Targets (ATs) are being suspended from September 2012. 2. Schools will continue to be required to teach ICT across all Key Stages. 3. Schools are free to continue to use the PoS and ATs if they wish. 5. A draft PoS for ICT in KS1 and KS2 will be published later this year for consultation. This will be MUCH thinner than the current PoS (note the emphasis on the word MUCH). 6. The DfE do NOT think it is their role to provide a vision for ICT – they want to see a consensus emerge from the experts in the field (industry, HE, schools) about what the (VERY THIN) PoS for ICT should look like. 7. The possibility still remains for Computer Science to be included in the eBAC if a suitably rigorous specification emerges for GCSEs (note importance of word Science in Computer Science in this context). I think that the draft PoS is going to be critical in terms of helping schools to think about their ICT provision between now and September 2014 – they need to ensure that they are maintaining and developing their capacity to deliver a high quality ICT curriculum so that they can hit the ground running in 2014. It was clear that the DfE wanted a consensus to emerge from the expert community (industry, academia and schools) about what the revised ICT PoS should contain. What is unclear is how that is going to happen, given the DfE’s stated desire to let the community sort it out. Will the likes of CAS and Naace be able to agree? How will real teachers’ voices (not just those of the well organized special interest groups) be taken into account? How do you reach a good outcome if decisions are being made by majority vote or based on who is most vocal? 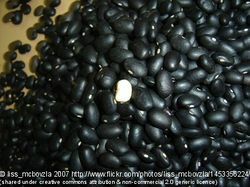 Thu 14 Jun 2012, 09:29. Let's be clear that the only consensus this government wants is the privatisation of the education system. It already has special interest groups for this in clearly identified companies and bodies like WEF. We need "a Leveson" enquiry on the commercial influence on the higher values of educational purpose and how this should be regulated. 8-June-2012 What do you mean by ICT? One of the major problems surrounding the use of ICT in education, and in particular the current debate about the role of new technologies in the revised National Curriculum, is that we talk at cross-purposes. This is because we use the same words to mean different things. Thus, for example, people criticize the teaching of ICT when what they really mean is the teaching of IT at Key Stage 4, or [more…] they talk about Computer Science in one breath and ‘knowledge age skills’ in the next as if they were the same (or even similar) things. We need to agree some definitions for key terms related to the use of new technologies in the National Curriculum. Given the high profile of the Royal Society Report on Computing in Schools (2011) it makes sense to base our definitions on the ones that they suggested – though with some adaptations to reflect the very particular focus of that study, which for example, explicitly excluded cross-curricula use of new technologies. Computing: a broad term that the Royal Society report equates to ICT. Computer Science: the scientific discipline of Computer Science, covering principles such as algorithms, data structures, programming, systems architecture, design, problem solving etc. Embedded Technology (ET): the use of new technologies across the curriculum (i.e. in all subjects other than ICT). This requires understanding how new technologies change the discipline (which the school subject relates to), and how new technologies extend the range of pedagogical strategies available. It also requires competence in using relevant technologies. There is overlap between ET and areas of ICT - but it is important at present to have an explicit term within education for cross-curricular use of new technology where learning through rather than learning about the technology is the primary focus. The current debate often seems to confuse the preceding terms with what might be called ‘knowledge age skills’. ‘Knowledge age skills’, would include such things as: team working, collaboration, leadership, communication, learning to learn, real problem solving, creativity, etc.. Whilst ‘knowledge age skills’ may be learnt in the context of ICT (i.e. Computer Science, IT and Digital Literacy) they are NOT the same things, and teaching ICT may not be the most effective way to develop ‘knowledge age skills’. "Embedded Technology" is an interesting addition to the terminology, Peter. I think it flags up another dimension, that of teaching as well as learning. I can imagine a student wanting to gain a qualification at 16 in 'computer science' or 'ICT' but not 'embedded technology'. ....This of course opens up a whole can of worms around what we mean by "technology"! My definition? "Technology is stuff that doesn't quite work yet" :-) (nobody calls a kettle technology because it just works, nobody refers to using biros as 'technology suppported learning' - yet Victorian engineers would probably be awe struck by the technical innovations contained in these tools....). I think it is always difficult to define precisely a subject that is "growing". IT is such a subject as all the time there is new content that needs to be included and new developments in technology bring up new issues. The definition for computer science is fairly easy to do - it is a nice self contained area, but as soon as you consider IT then there are so many different issues to consider from psychological to economic to legal. Additionally every new use made of computer technology brings us in to a new area, for example the increasing use of GIS systems is throwing up many longer term issues about their use. I am almost coming to the conclusion that IT is actually at least in part a social science rather than a science and is the study of how computer technology is used ( the IT above?) and how it affects the world in which we live ( the digital literacy but not just from a personal or short term perspective ). I think it is dangerous to be too short sited in our vision. Perhaps this view will generate some discussion!! 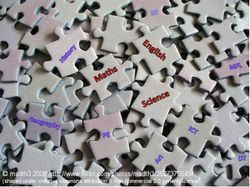 The nomenclature used to describe technology related areas in education is a big issue, with misunderstanding and confusion as the same term may mean different things in different sub-sectors of education. For example, Information Systems in HE is generally understood to relate to Library systems, whereas the use of the term Information Systems in Schools and Further Education is typically linked with data systems. This is only the tip of an iceberg with terms in use in one sub-sector not being in common usage in another sub-sector. For instance Information and Learning Technology (ILT) is understood in Further Education and Information and Communication Technology (ICT) is used in Schools to describe the same technology. Common understanding across the education sector with concise definition of terms should form a part of any review. When these things are often discussed on the radio or TV it does seem that certain terms get kicked around with different meanings attached to them. It's an arena with so much happening all too often there are many buzz words and it's probably quite easy for people to feel left behind and disengaged. The terms above certainly help make certain distinctions clear to me and it would be great to see more work towards this. Computer Science obviously has a nice wrapper around it and you can see this fits into being taught as a specific subject. There also seems to be a lot happening in establishing the core concepts at younger ages, with things like graphical programming languages and cheap computing through the Arduino and Raspberry Pi. I like the description for Information Technology, with an emphasis of this being focused around the 'application' of technologies around a specific purpose. IT seems to be a polluted word that will be harder to redefine, specifically since it's slightly more focused here compared to the industry. With regards to Digital literacy, are the kids in the classroom currently have discussions about the impacts of new technologies on society? I bet you could have some really great lessons around that! Progress has been made in clarifying the debate and moving towards agreement about how to address problems with the teaching of ICT in schools. However, there are still areas where effort is being wasted in arguing at cross purposes or about issues which are ‘academic’ and ignore the practical realities of the review of the National Curriculum (NC). 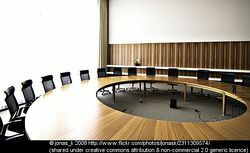 The table below summarises areas where there appears to be agreement forming or the issue is non-negotiable (as in the case of what a future ‘ICT’ related NC subject would be called, which is non-negotiable due to legislative constraints) and ones which seem to still be causing confusion or a consensus has not yet emerged. ICT, IT, CS, Digital Literacy etc. This page was last modified on 12 September 2013, at 03:27.